Allegations of judicial bias occasionally make the news when a litigant asserts that the proposed Judge is so biased that a fair trial cannot be obtained, and the Judge is asked to recuse him or herself. Bias is very different from a court finding a witness not credible, loathsome or some other unworthy adjective- those comments might appear after hearing the evidence and then such conclusions might be made by the court. Judicial bias is often asserted prior to a trial such as when President Trump asserted he could not get a fair trial in front of an American born Latino judge due to Trump’s “Build a Wall” comments. Suh applications rarely succeed as they generally have no probative value, similar to Trump’s. Everyone has some biases including Judges, but Judicial bias is something far more serious to the point that it requires cogent evidence in addition to the reasonable expectation that bias might exist and a fair trial not be posible. 1. All adjudicative tribunals owe a duty of fairness to the parties who appear before them. The scope of the duty and the rigour with which the duty is applied vary with the nature of the tribunal. Courts, however, should be held to the highest standards of impartiality. 2. Impartiality reflects a state of mind in which the judge is disinterested in the outcome and is open to persuasion by the evidence and submissions. 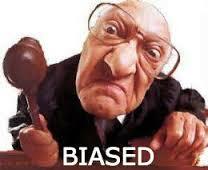 In contrast, bias reflects a state of mind that is closed or predisposed to a particular result on material issues. 5. The party alleging bias has the onus of proving it on the balance of probabilities. 6. Prejudgment of the merits, prejudgment of credibility, excessive and one-sided interventions with counsel or in the examination of witnesses and the reasons themselves may show bias. The court must decide whether the relevant considerations taken together give rise to a reasonable apprehension of bias. 7. The threshold for a finding of actual or apprehended bias is high. Courts presume that judges will carry out their oath of office. Thus, to make out an allegation of judicial bias, requires cogent evidence. Suspicion is not enough. The threshold is high because a finding of bias calls into question not just the personal integrity of the judge but the integrity of the entire administration of justice. 8. Nonetheless, if the judge’s words or conduct give rise to a reasonable apprehension of bias, it colours the entire trial and cannot be cured by the correctness of the subsequent decision. 23 From these principles it is clear that the test for judicial bias is an objective one: what would the informed person reasonably conclude from the facts. Unimac disagrees.